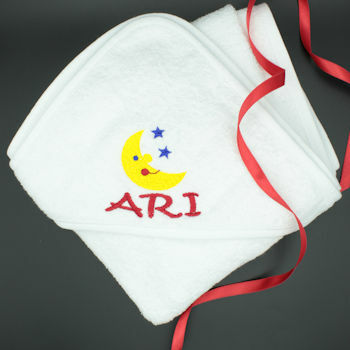 Moon and stars embroidered hooded baby towel with a red trim around the edges and babies name personalised on in red thread. Moon and stars embroidered hooded baby towel with a red trim around the edges and babies name personalised on in red thread. Quality soft hooded cuddle towel made from 100% cotton measuring approximately 75cm by 75cm to dry baby after bath time. Fill in a name for us to embroider. Fill in a name for us to embroider. We will embroider in a thread colour to match the trim.